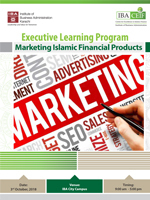 IBA Centre for Excellence in Islamic Finance (IBA-CEIF) is offering a unique intermediate level one-day course on the art of Marketing Islamic Financial Products. The course is designed to provide the participants with a comprehensive understanding of the market for Islamic Financial products. The course operationalizes several marketing concepts such as segmentation, targeting and positioning, and demonstrates the role of branding in the context of Islamic Financial services. The trainer will enrich the classroom discussions with universal practices and cases enabling the participants to gain insight into the mind of the consumer to gain a competitive edge.